We’re not big fans of cauliflower cooked plainly and then served as is. However, we do eat it regularly enough – in a potato mash, along with mild English mustard, to accompany a beef dish; as the main ingredient in a souffle, as described in a recent post; and as one of the vegetables in a Thai red curry of chicken or pork, as will be described in a future post. 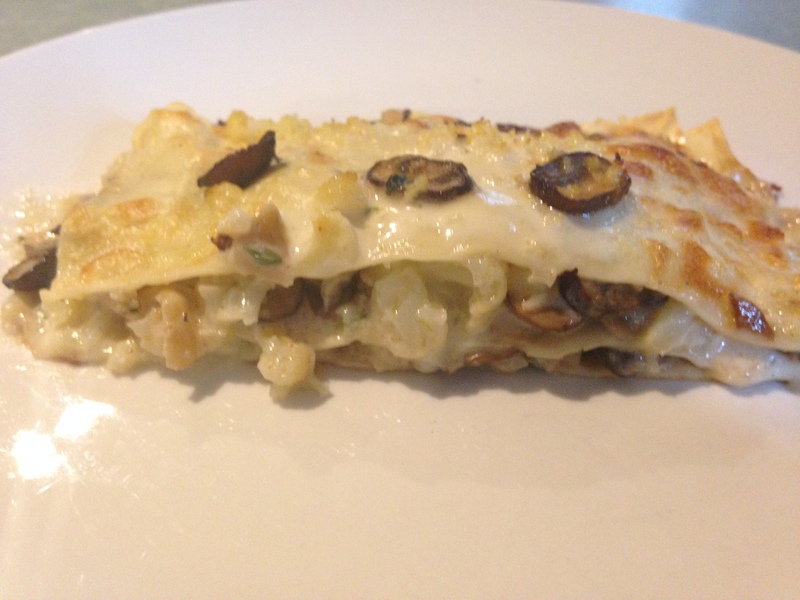 This innovative lasagne dish is a fourth way we cook cauliflower, inspired by a Patrizia Simone recipe and enabled by a pasta machine we bought in order to cook some of the dishes in Patrizia’s book. Based on instinct, experience and the limitations of our domestic kitchen, we have made some significant changes to the original recipe. Having just made it for the third time, we now feel settled on our version of the recipe. Firstly, this is a rich dish, plenty for three middle-aged adults. 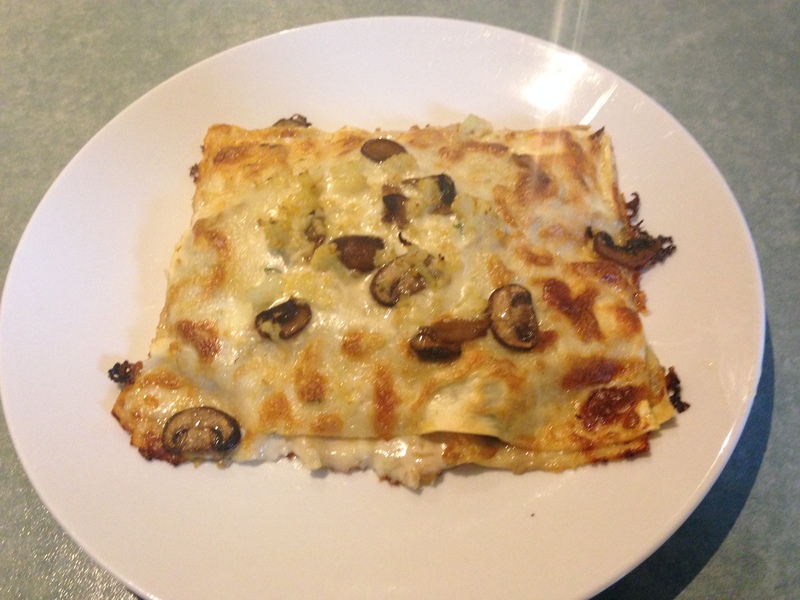 When we cooked this over the weekend, we over-sized the sheets of lasagne and made only two stacks. I ate a whole stack and later felt a combination of guilt and physical discomfort. Secondly, Taleggio and Gruyere ‘pongy’ cheeses – apologies for being so technical – so, if that doesn’t appeal to you, I imagine you could substitute some Camembert or similar. 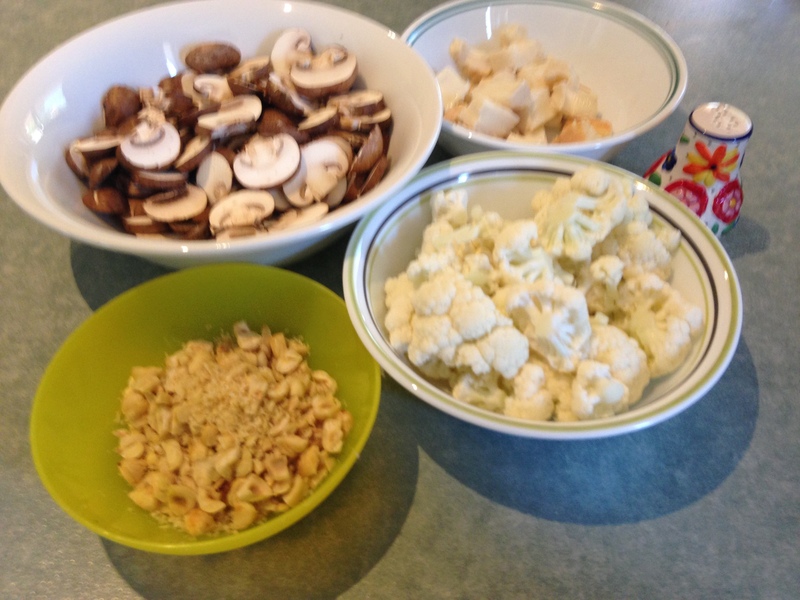 Cook the cauliflower in boiling salted water for 6-8 minutes or until tender. Drain well. Heat 15ml oil in a frying pan over medium heat, add cauliflower, sprinkle with a little cayenne or chilli and sauté for 5 minutes, transfer to a bowl and lightly season with salt and pepper. Heat 20ml of oil in the pan and add the sliced mushrooms. Cover 90% with a lid and alternately steam the mushrooms in their own liquid and take lid off to toss the mushrooms with some tongs. Add the garlic when the mushrooms have begun to soften, put the lid to one side and continue to toss until the garlic is soft and the mushrooms are just beginning to brown. Sprinkle with thyme leaves, season and transfer to another bowl. Chop the hazelnuts roughly, with most pieces about ¼ of a nut in size. Heat the cream gently in a non-stick saucepan. Add the Taleggio and stir until it has melted and combined with the cream. Remove pan from the heat, add the remaining thyme leaves and mix them in. Prepare the pasta dough for making lasagne. Cut 9 pieces approximately 10cm square and cook in three batches in plenty of boiling salted water for 3 minutes. Transfer to a bowl of cold water then drain on a tea towel. 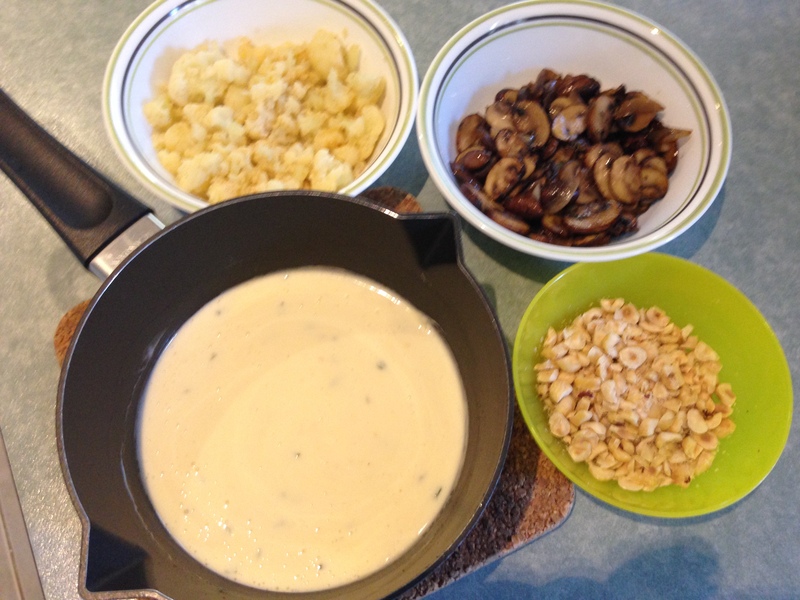 Assemble three stacks of lasagne, directly onto a large sheet of baking paper in a roasting pan, as follows: 40% of the cheese sauce, 50% of the nuts, 40% of the cauliflower and 40% of the mushrooms on each of the first and second pieces of lasagne; remaining sauce, cauliflower and mushrooms on top of the final piece of lasagne. Bake in the oven for 20-25 minutes, until the top layer is just golden brown. 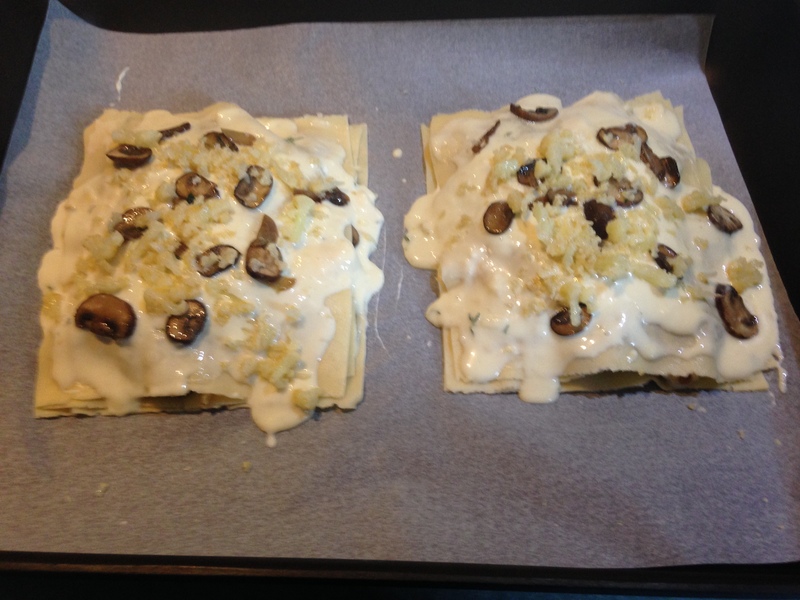 This entry was posted in Cooking and tagged cauliflower, Home made pasta, lasagne, mushrooms, Taleggio cheese. Bookmark the permalink.